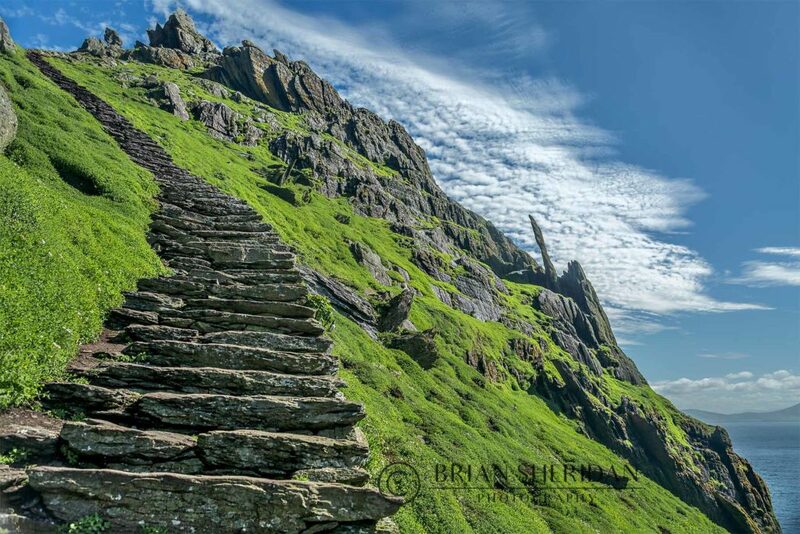 For years I’ve wanted to visit The Skelligs well before ‘Star Wars’ and all of that. I was fascinated by these rocks protruding out of the Atlantic.These Skellig islands are world-famous, each in its own right: Skellig Michael is known throughout the world of archaeology as the site of a well-preserved monastic outpost of the Early Christian period – now designated a UNESCO World Heritage Site; Small Skellig is equally renowned in matters of ornithology as the home of some 27,000 pairs of gannets – the second largest colony of such seabirds in the world. 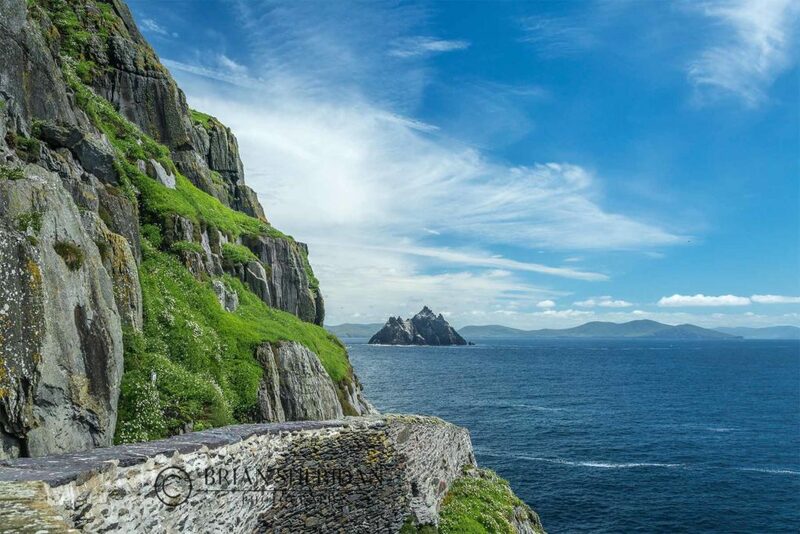 The Skellig Islands are two massive rocks twelve km out from the Kerry coast. Over one thousand four hundred years ago a small group of men were searching for a place to practice their religion in solitude and isolation. 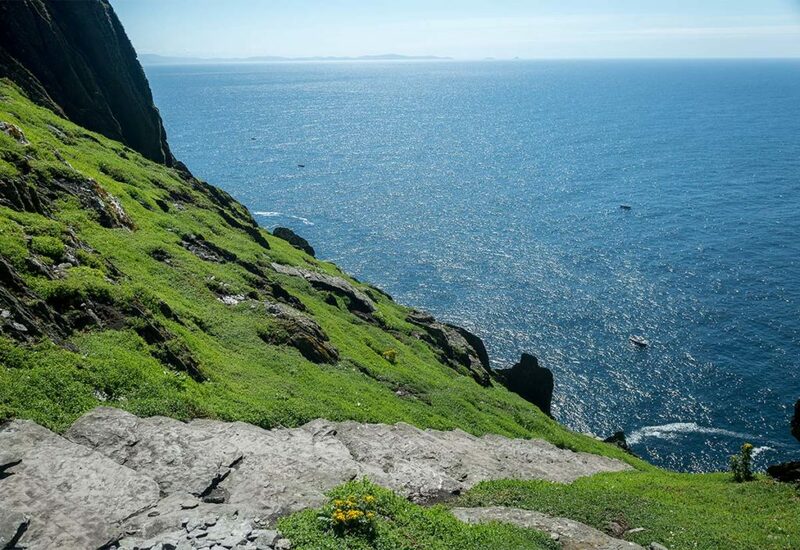 These remarkable men ventured into the open ocean off southwest Ireland determined to build a monastery on one of the most extraordinary locations on earth. On the edge of a cliff almost 200 metres above the waves they built a monastery. 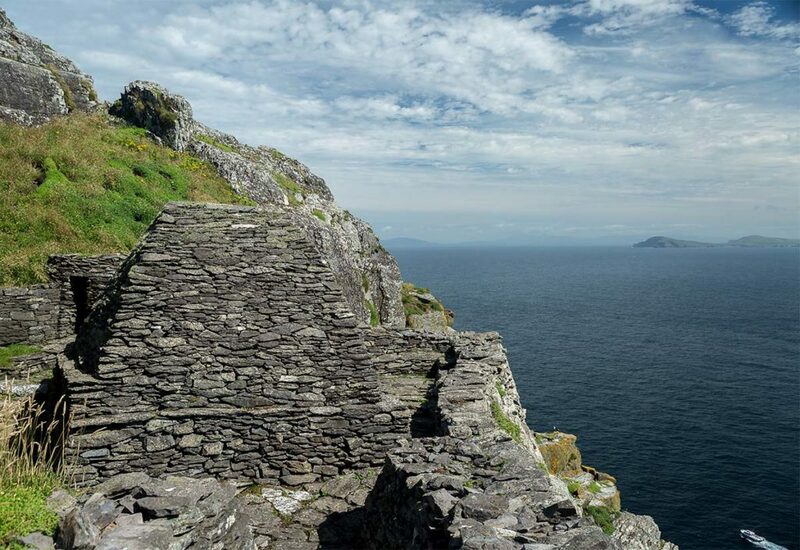 The monastery has six stone beehive huts and two boat-shaped oratories, the stone built terraces, retaining walls and stairways are visible proof of such Early Christian Activity. Such was their skill and dedication the terraces and dry stone walls survive intact to this day, making it a UNESCO WORLD HERITAGE SITE of outstanding universal value, the worlds most striking example of early Christian architecture. 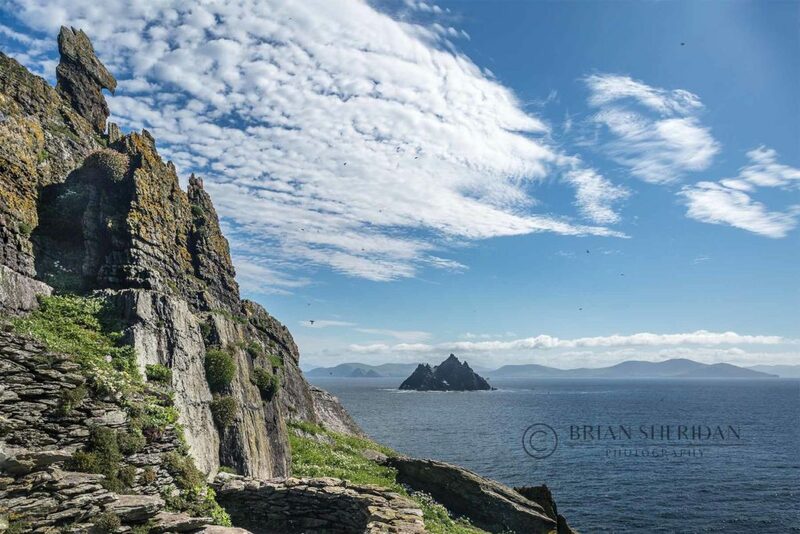 Last year I booked four times to get out to Skellig Michael but each time the sea was too high and the sailings were cancelled. I was delighted when I got out last week. Even when I got a new date for getting out I still feared that it would be cancelled again. I kept a close watch on the forecast and it was looking good. I travelled down from Kildare with my friend Richie, over four hours drive still not sure that we would get out. A quick call that evening to the boatman Pat and he confirmed that we were surely going in the morning. We stayed in Cahirsiveen the night before. 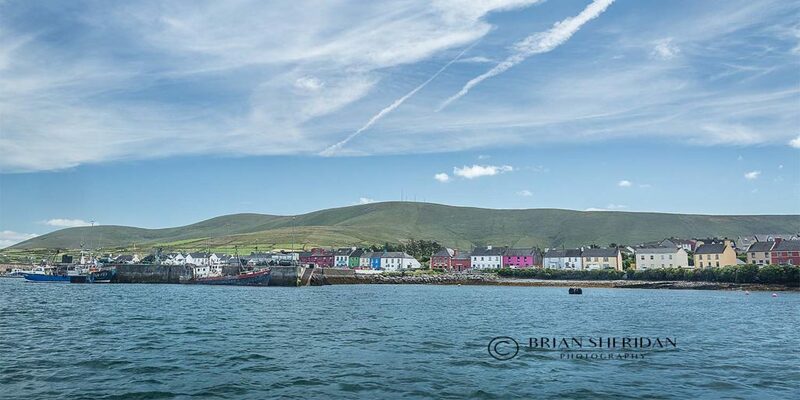 Cahirsiveen is a very small town about 15.5 kms from Portmagee (from where you sail to skelligs). There are some nice little pubs in the town. 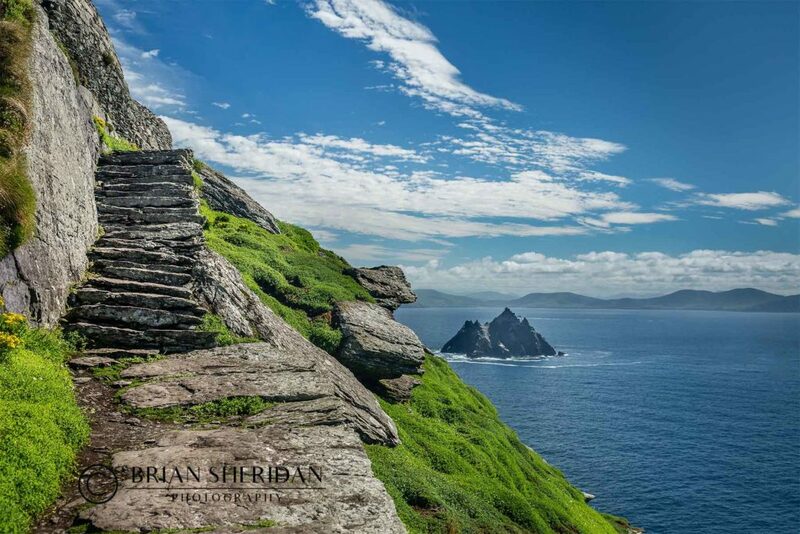 Don’t stay in them too long if you are going out to The Skelligs in the morning !!! The friendly lads behind the bar in The Anchor recommended a bistro called Cabo’s (just opposite the RC church) …very good recommendation . Fab sea food among other dishes. We did a reconizance trip to Portmagee the evening before to get our bearings.We called into The Moorings for food. They had an extensive menu. We went for seafood chowder, it was very poor, didn’t try anything after that. I had travelled light with regard to my camera gear. I left my Canon 70mm-200mm.F2.8 L at home because it weighs a ton and I brought a 75mm-300mm. not a pro lens but it’s brilliant and very light. I had my Canon 5D 111 and my trusty 28mm-70mm L. I thought the 28mm would be wide enough but I was mistaken, I could have done with my 17-35mm. No tripod (too heavy) and one cir-polariser filter. As it turned out I didn’t need the 75-300. We were to sail at 9am from Portmagee. We met Pat and Des, the boatmen opposite The Moorings Bar. Had a safety briefing and set sail. The boat was in great shape and looked fairly new. It had all the safety equipment required and everybody put on life vests. The safety talk given by Des was perfect and reassuring. The weather was perfect, sunshine and no wind. The sea conditions were also perfect with only a slight swell. 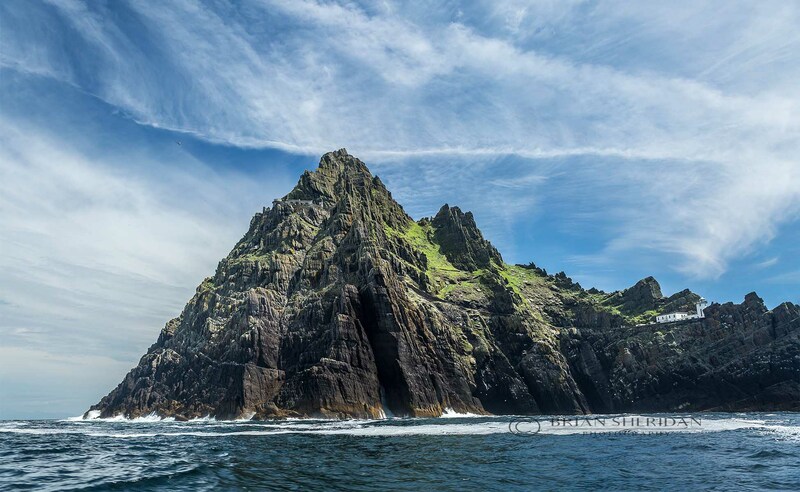 It took just under an hour to reach The Skelligs. The sight of the islands getting nearer in such fab conditions was amazing. 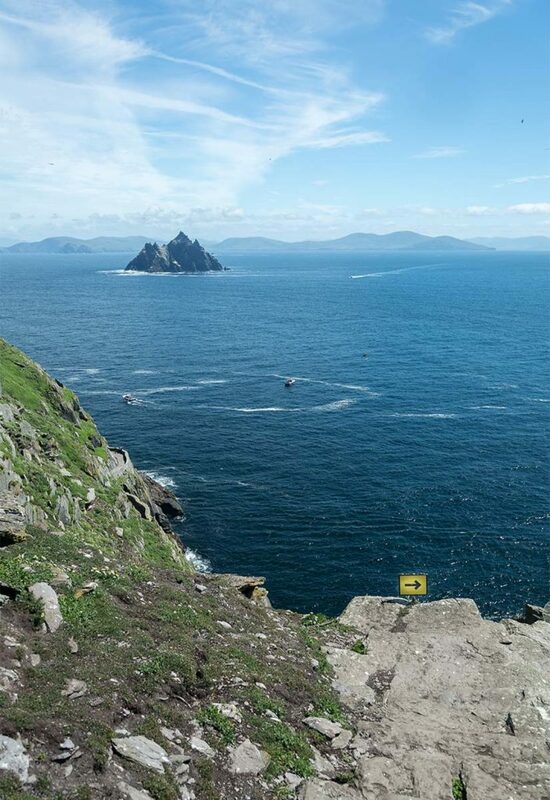 We were on Skellig Michael at 10am and instructed to be back at the boat at 12.30pm. After disembarking we were met by an OPW staff member who gave us a safety talk and off we went, heading to the top of the 714 foot rock. I’m not the best with sheer drops and cliff edges etc. so it was with a little trepidation that I started out. The presence of lots of Puffins was a great distraction. The puffins are everywhere, literaly at your feet. 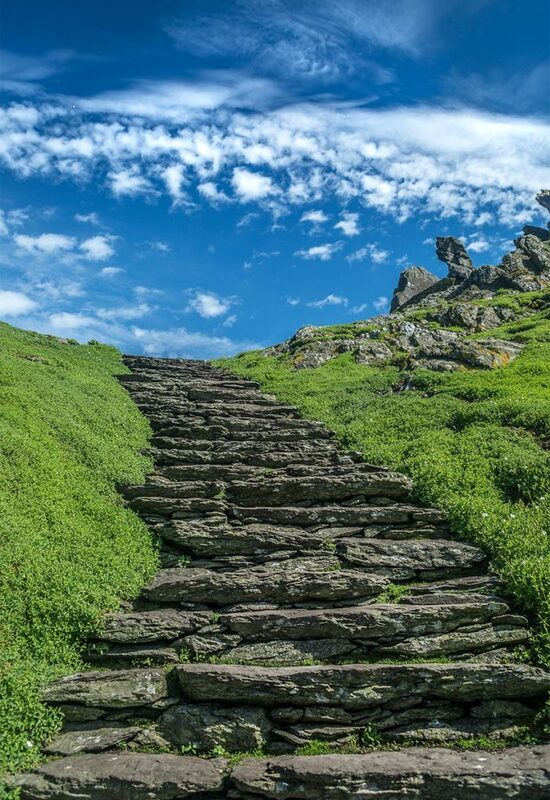 The steps are helpful but they are of different sizes and are extremely uneven. Don’t think stairs or regular steps. Some people set out to climb and find the fear too much and freeze. We were advised that ten people on average per day fail to reach the top. There are regular accidents and sadly a few fatalities. As I headed up I felt privileged to be there. It was amazing. I’ll let the pictures I took tell the story. What do you think of my Puffin friend !!! After some time you come to an area called Christ’s Saddle, you are nearly at the top at this point. It is an opportunity to rest and get your breath back and to marvel at the beauty of this place. I took some pictures here and I had Black and White in mind and I think it works. 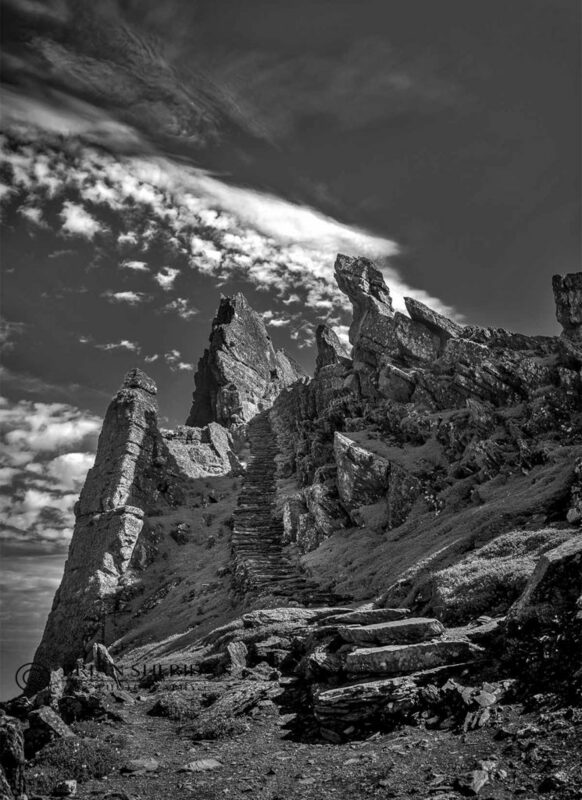 They could be from some of the great National Parks of the U.S. like an Ansel Adams picture from Yosemite. When you get to the top you are met by another OPW guide who gives a talk, which explains the history etc of the monastery. It’s really fascinating and the talk was delivered brilliantly. It is very difficult to take pictures at this point because of the gathering of people. I got some. As I wandered around the monastery I was thinking of these great men who built it, the hardship, the fear etc. the Vikings called one day and kidnapped the head man !!! Now if you thought climbing up was scary….wait until you see what coming down was like. If you don’t take a sharp right at that arrow as you come down very steep steps, you will be at the bottom before your friends are !!! When I got to the bottom, I felt really good. It was an accomplishment that brought great satisfaction. It was a great experience. The boat was waiting at exactly 12.30pm as the crew had said. 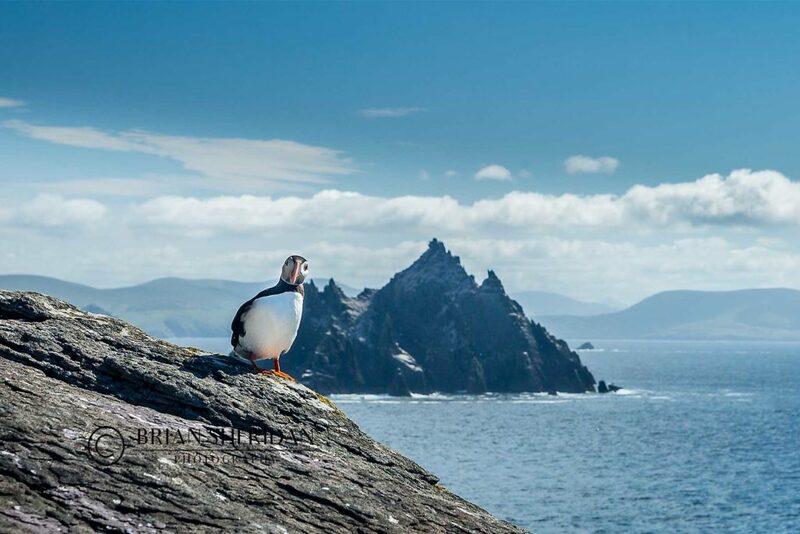 They then brought us around Skellig Michael, which was not part of the deal. They kindly treated us to a little extra and it was amazing. They pointed out the old light house and the new one. The new one was built over 100 years ago ! The gannets can be seen in numbers flying around the island. It is like a scene from an Alfred Hitchcock movie. We then steamed back to Portmagee. We thanked the wonderful Pat and Des and headed into The Fishermans Bar for a pint and some food. This place was recommended to us and it sure didn’t disappoint. The sea food was fab. The shell fish platter and the sea food platter was what was recommended by our friend. We ended up ordering seafood chowder for starters and a seafood platter for two. OMG the chowder was the best I’ve ever had, anywhere. I love chowder, but too often I’m disappointed but this was incredible. Full of flavour and with big chunks of all sorts of fish to be found in it. A meal in it’s self. Then came the seafood platter. Fantastic !!! A great selection of fish, including warm and cold, with crab meat, claws and mussels in a garlic crust. All tasty and fresh. This came to €52.65 including two pints of Guinness. 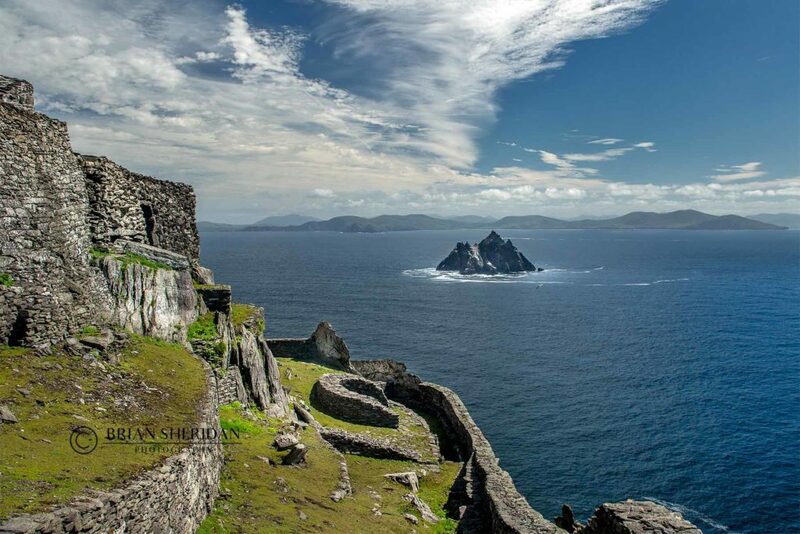 It was only two days in Kerry but it was two days in heaven. Every where we went we met friendly, courteous and helpful staff…. without exception. 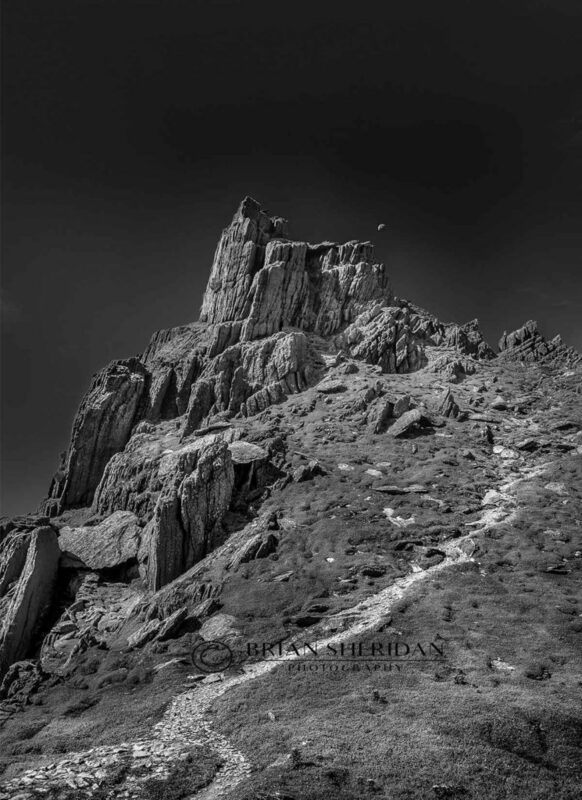 My adventure to The Skelligs, that I planned to do for years did not disappoint and I hope you agree that I have some great pictures to cherish. Be prepared for cancellations due to weather and/or sea conditions. I got out on my 5th attempt. feet for the next shot. 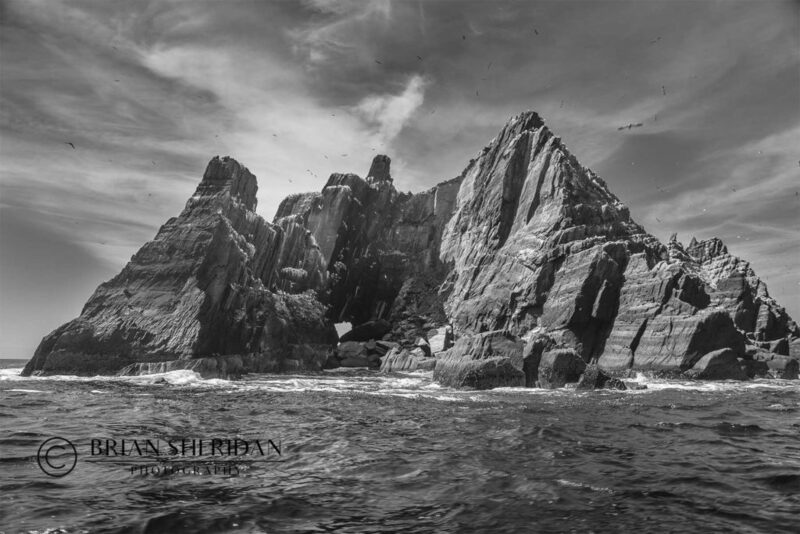 Visit ‘The Skellig Experience’ visitor centre on Valentia Island. Short distance from Portmagee. It’s really worth it, very informative. Brian, you are gifted!!! Loved the article…excellent. The photos are AMAZING!!! I was admiring some of your work at Straffan Antiques, straffan yesterday..I wasn’t the only one admiring them either. Keep up your stunning work. All original images contained on this website are the sole copyright protected property of the photographer. No content may be copied, reproduced, downloaded or distributed without prior permission of the photographer.